A repeat winner. Without the hearty support of the Arts & Science Council, Actors Theatre of Charlotte made its 20th season a true milestone. Along with the usual surpassing excellence of Lieutenant of Inishmore, Rabbit Hole, and Blue and successful remounts of Santaland Diaries and Bat Boy, Actors Theatre surpassed itself with the world premiere of Eric Cobles Southern Rapture. 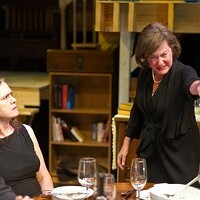 Powered by a private grant of $50,000  more than the ASC has granted Actors Theatre for any of its 20 excellent seasons (or the 2009-10 season ahead)  Rapture comically and perceptively revisited the Angels in America fiasco of 1996, spattering satire on liberals, conservatives and religious wackos with equal glee. The effort served as a winning application for admission into the National New Play Network, an elite group of 26 regional theaters that has more of my respect than our ASC, which is doling out a whopping 2.2 percent of its 2009 fund drive to adult and community theater in the Char-Meck area.